TORONTO (February, 10, 2010) – Toyota introduced the boldly redesigned 2011 Avalon today at the 2010 Chicago Auto Show. Evoking a time when travel was sophisticated, elegant and comfortable, the new Avalon possesses a distinctive new exterior style while offering a restyled interior rich with premium touch points and practical new technologies. With numerous refinements inside and out, the Avalon remains true to the idea that comfort is honest and uncomplicated, and “Traveling Avalon Class” is rich in simple, familiar pleasures. The new Avalon has dynamic and expressive lines, and an infusion of comfort, safety and technology advancements that enrich the driving experience. Upgraded equipment and technology features, such as a touch-screen navigation system with real-time traffic, and Bluetooth hands free phone capability with music streaming to the audio system are among the improvements that enhance the 2011 Avalon’s excellent blend of spaciousness, comfort and technology. “Discerning drivers know that the Avalon is a symbol of fine craftsmanship, and has long been sought after for its well-appointed materials and spacious cabin,” said Warren Orton, Director at Toyota Canada. “The 2011 model adds even more style and features that elevate the driving experience." Restyled at Calty Design Research in Newport Beach, Calif., the Avalon is assembled at Toyota Motor Manufacturing Kentucky (TMMK), a “zero landfill” facility that also assembles the Camry, Camry Hybrid, and Venza. 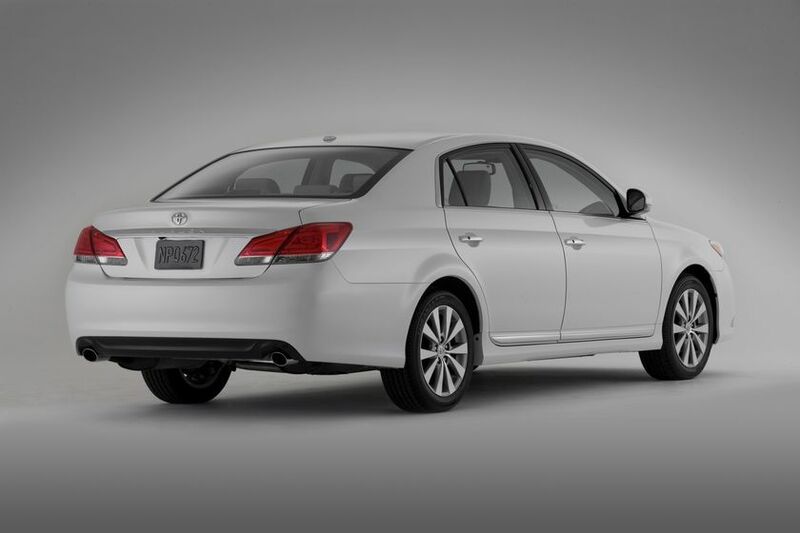 It was also developed at the Toyota Technical Center (TTC) in Ann Arbor, Mich.
For 2011, Calty restyled Avalon to project an elegant, outgoing presence. A wider, more substantial grille ties into state-of-the-art projector headlamps, working with a broad, undisturbed front hood to suggest a lowered center of gravity and emphasize the Avalon’s wide stance. The new headlamps, which combine multi-reflector halogen high beams with halogen low beams, utilize light pipes to create a signature, night-time appearance. The front fog lamps, now integrated into a trapezoidal front bumper, provide a wider angle of illumination. Viewed from the side, the 2011 Avalon is enhanced by additional use of chrome trim, redesigned rocker panels, and reshaped, glare-resistant outer mirrors with integrated turn signals. New 17-inch wheels feature a 10-spoke design with a silver finish. 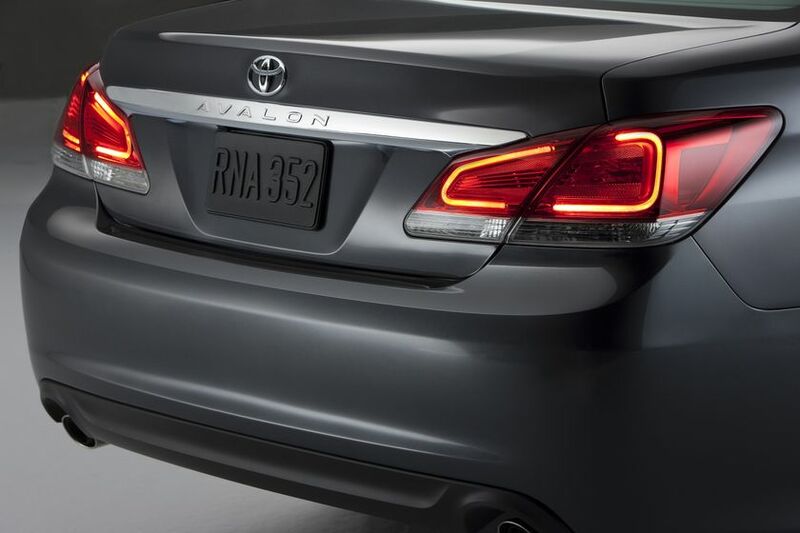 At the rear of the car, identification is cleanly defined by a single Avalon logo located above the license plate. Dual-exhaust pipes are integrated into the cutaway trapezoid shape of the lower bumper for a modern image. Taillights have been reshaped to reduce turbulence at the rear, helping to create a lower coefficient of drag. The new lights integrate stop, turn and side marker lighting functions in one combined lamp. Unique LED light pipes with dark aluminized sides and both clear and red lenses project modern appearance. For 2011, a new interior has been designed with a contemporary style. The new interior remains generously spacious and elegant, fitted with comfortable seating and thoughtfully integrated amenities. Coordinated colors and rich wood-grain materials were carefully chosen to convey an optimistic attitude and modern essence. Standard heated leather-trimmed front seats and seatbacks are fitted with active front headrests, and thicker stitching provides an elegant accent to the interior design. The rear seating area is configured to seat three passengers comfortably, with ample legroom and reclining rear seats, unique in the segment. The rear headrests have also been reshaped and enlarged for better support, and a convenient flip-down center armrest provides storage when the middle seat is not in use. A new instrument panel incorporates visually attractive and highly readable Optitron gauges that use graduated white illumination with white pointers. They are set inside smoked lenses and deep chrome rings that add depth and a sense of luxury. The steering wheel includes controls for Bluetooth hands-free phones, the audio system, climate system, and the information center. A comprehensive infusion of technology was designed into the new interior to ensure an enriched environment, with enhanced function and connectivity. New standard equipment includes Bluetooth® hands-free phone and music streaming to the audio system from a compatible device, XM satellite radio (subscription required), and both USB and 1/8-inch auxiliary connections for iPod® and other audio devices. Each of the three available audio systems can control iPods seamlessly using switches located on the steering wheel and display track information stored in the device. Toyota’s latest DVD Navigation system has a newly adopted database and is now more easily searched with easier address input. 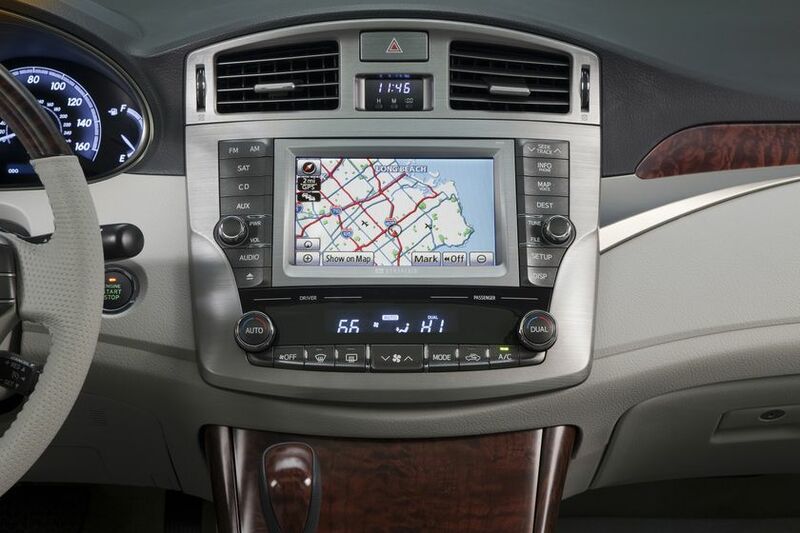 The Navigation system also offers new displays for road icons and points of interest, and a keyboard screen arranged in the same way as a personal computer. The Avalon XLS standard 12-speaker system offers exceptional sound quality, from the 660-watt JBL Premium Synthesis audio system with enhanced two-coil sub-woofer. The system uses 12 speakers and a 12-channel digital amplifier to deliver profoundly rich, full sound to all seats of the vehicle. A rear-view monitor function is standard with the navigation system. The image includes on-screen back-up guides to that help drivers to back into parking spots or driveways. Avalon’s exceptional combination of ample horsepower and excellent fuel economy offers one of the best overall dynamic performances in the large sedan segment. The 2011 Avalon is powered by a 24-valve, double-overhead cam 3.5-liter V6 engine that produces 268 horsepower at 6,200 rpm. The engine is equipped with the latest dual VVT-i electronic valve-control mechanism that provides a broader powerband, while requiring less fuel and generating fewer emissions. It is mated to a multi-mode six-speed automatic transmission. The 2011 Avalon is rated at Tier 2 Bin 5 emissions rating and fuel economy ratings are estimated to deliver 10.7 L/100km in the city, 7.0 L/100km highway, and 9.0 L/100km combined. A roadworthy mix of fine ride quality and accurate driving control is delivered by the Avalon’s MacPherson strut suspension, which uses coil springs at all four corners. Rack-and-pinion steering combines with front-wheel-drive and optimized steering gear for a natural handling feel. Wiper positioning and mirror shapes have been fine-tuned as well. A dual-zone climate control system has nine air-flow modes for more precise control of interior climate, and a clean-air filter removes dust and pollen. Doors use three stop positions instead of two for easier entrance and exit. A lockable glove box has been fitted with a pneumatic-door damper and inner box illumination. The front-console box has a sliding armrest that moves 119 mm front to rear, able to accommodate a wide range of driver positions. The elegantly stitched top has been widened and padded with a double density cushion material for softness. Inside, there is a 12-volt outlet in addition to the USB and auxiliary audio terminals. The new Avalon’s occupant-safety strategy includes use of extensively tested energy absorbing structures, protective side impact beams and overhead structure, advanced belt systems and active front headrests as standard equipment. Avalon will also have a redesigned accelerator pedal assembly and a brake override system. Seven airbags, including a front knee bag for the driver, and front side curtain airbags for both rows, are also standard. Toyota’s standard Safety System includes Vehicle Stability Control (VSC), anti-lock braking system (ABS) with Electronic Brake force Distribution (EBD), Brake Assist, and TRAC traction control system. TRAC and VSC functions can be disengaged if the driver needs to free the vehicle if stuck in mud or snow. A full-size spare and alloy wheel is standard. Each wheel has its own pressure sensor to warn if tire pressure drops, providing the driver with an early warning to find a safe place to change a tire. The 2011 Avalon will be available only in XLS grade when it arrives in showrooms in the spring of 2010. A high level of standard equipment include power moonroof an eight-way passenger’s seat with lumbar support, driver’s seat cushion extension and Smart Key. Avalon will be available in six exterior colors including one new colour: Sizzling Crimson Mica. Additional colors include Blizzard Pearl, Classic Silver Metallic, Magnetic Gray Metallic, Black, and Sandy Beach Metallic. Avalon XLS will be mated to two leather-trimmed interior colors: Ivory and Dark Charcoal. Toyota’s 36-month/60,000 km basic new-vehicle warranty applies to all components other than normal wear and maintenance items. Additional 60-month warranties cover powertrain for 100,000 km and corrosion with no mileage limitation. Toyota dealers have complete details on the limited warranty. 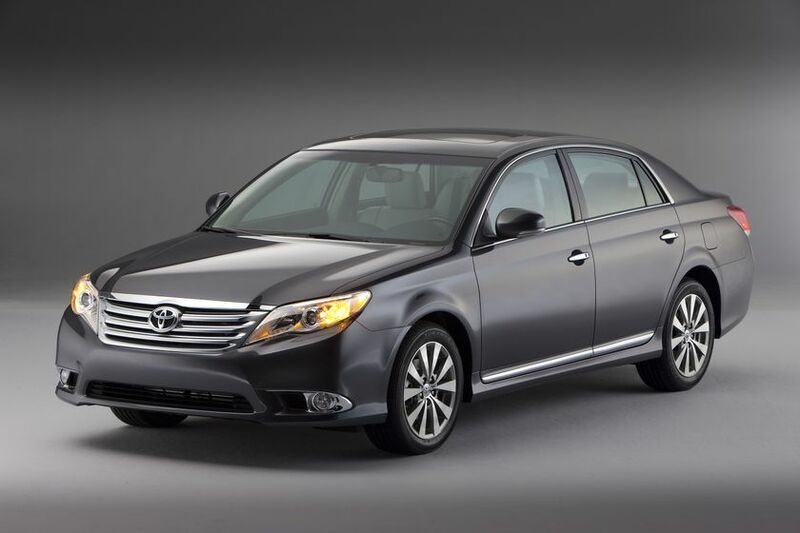 The redesigned 2011 Avalon will begin arriving at Toyota dealerships in March 2010.